While stuck in an L.A. traffic jam, Gerd Ludwig was struck by a tourist questioning where all of the cars go to rest at night. Over the past seven years, Ludwig has been photographing cars in Los Angeles in between assignments for National Geographic and other magazines. 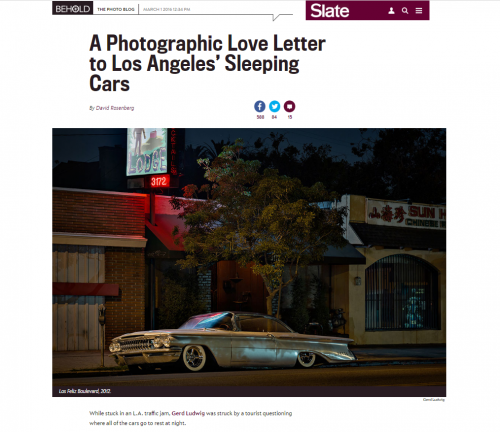 A self-described night owl, Ludwig searches “ceaselessly for cars that speak to me” and has created a series about them called“Sleeping Cars,” which is on view at Fahey/Klein Gallery in Los Angeles through March 19. It can take many hours—and miles driven—for Ludwig to find cars that appeal to him. He sometimes uses small hand-held flashes to light the scene or even his own car’s lights or those of a passing car; nothing else. He searches for cars and scenes that have an “emotional quality.” In that way, the project is in many ways an ode to Los Angeles.